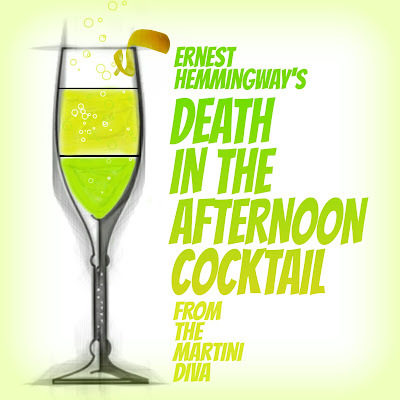 Since it's National Absinthe Day a good cocktail to talk about would be what Ernest Hemingway himself called Hemingway's Champagne, otherwise known as Death In The Afternoon, named after Hemingway's book of the same name. It's a potent drink supposedly enjoyed by Hemingway after his stay on the Left Bank of Paris where he was introduced to Absinthe. Hemingway later contributed the recipe to a 1935 celebrity cocktail book called So Red the Nose, or Breath in the Afternoon by Sterling North and Carl Kroch. In it Hemingway states the drink originated "by the author and three officers of the H.M.S. Danae after having spent seven hours overboard trying to get Capt. Bra Saunders’ fishing boat off a bank where she had gone with us in a N.W. gale." Or so the tale goes. Since Hemingway was known to be very inventive when it came to cocktails, (he also has his own Daiquiri namesake) I'd take the whole story with a grain of salt. Created in the days when absinthe still possessed it's infamous Green Fairy punch, I think they all might have had three to five of the powerful drink before putting pen to paper. HEMINGWAY'S ORIGINAL INSTRUCTIONS "Pour one jigger absinthe into a Champagne glass. Add iced Champagne until it attains the proper opalescent milkiness. Drink three to five of these slowly."